Morgan Motor Company was born in 1909 when its founder, Henry Frederick Stanley Morgan, decided to make his own cars in the town of Malvern, Worcestershire. His first car was a three wheel model which was fast, inexpensive and easy to maintain. In the late 1930’s the demand for Morgan cars increased and so a four wheeled vehicle was constructed which was both light in weight and powerful in performance. Sales rapidly increased and after the war production took off with the introduction of a Morgan 4/4 four wheeler together with the iconic three wheeler which was still being made. In the 1950’s a Morgan Plus Four with a 2000cc engine was introduced and the three wheeler was fazed out. The production of these cars remained the same until 1968 when the Rover 3.5 V8 engine was installed in the Morgan Plus Four chassis and the Morgan Plus Eight was born. This proved to be the most successful car the Company had made with 190 bhp and a top speed of 123 mph. When the V8 engine was no longer available a V6 Ford engine was installed which produced 280bhp with a top speed of 134mph. In 2000 Morgan launched the Aero 8, the first new Morgan design since 1948. A modern Morgan had been born with a BMW 4.8 V8 engine and a staggering performance. In 2011 Morgan iconic Three Wheeler was reintroduced with a V Twin engine and a top speed of 115mph. Morgan moves with the times and still to this day makes Real Sports Cars which are greatly enjoyed by all those that drive them. Many of these Morgan owners are members of the Morgan Sports Car Club which is for enthusiasts of Morgan Cars. It has 4,500 members worldwide with a network of 36 local centres in the UK and 43 affiliated clubs in other countries. The Club was formed in 1951 as ‘The Morgan 4/4 club’ but the name was changed in 1971 due to the numbers of +4 owners and the introduction of the +8 model. Morgan races and speed events, training and track days are regularly organised by the Club. The local centres also arrange their own programme of activities both social and competitive. 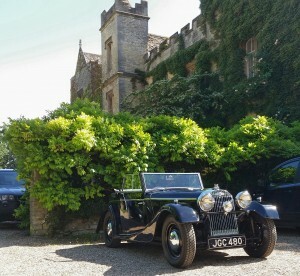 The Club has a technical section that arranges for parts to be manufactured when necessary and can offer advice on older cars, as well as an archive section for historical details. It is a club for those who enjoy Morgans, you don’t have to own one. 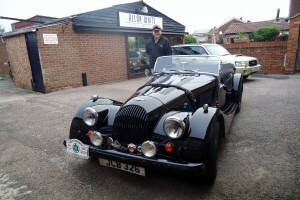 If you have a passion for the Morgan Sports Car do join the Club where you will be made very welcome.